Chico State's Chamber Singers will be performing a brand new work, "For Whom the Bell Tolls," a choral work born out of the Sept. 11, 2001, tragedy and jointly commissioned by Chico State and Fresno State University. The tragedy of Sept. 11, 2001, has resulted in a haunting choral work commissioned jointly by the choral departments of Chico State and Fresno State universities. "For Whom the Bell Tolls," a three-movement choral work by composer Bradley Nelson, was performed in its entirety for the first time ever at the prestigious California Music Educators Convention, March 15 in Pasadena. Choral ensembles from Chico State and Fresno State took the stage together to perform a work that Nelson described as "a dramatic, powerful choral statement about the anger and chaos of war." "For Whom the Bell Tolls" featured choral singers, solo flute, percussion and piano. "It has a variety of compositional techniques and textures, including dissonant harmonies, warm melodies and even shouting," said Jeffrey Gemmell, director of choral activities at Chico State. The idea of commissioning a piece to commemorate Sept. 11 came about when Gemmell and Anna Hamre, director of choral activities at Fresno State, went to the American Choral Directors Association convention in Hawaii. They met with Nelson and asked if he could write a work the two choral programs could perform together. "We talked about the shape the piece would take," said Gemmell. "Brad took a lot of input from Anna and I, and he also added some of his own ideas to it." 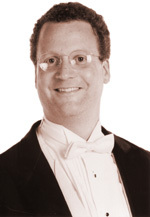 Nelson is a well-known composer, conductor and teacher. His choral works have been performed in Westminster Abbey, the Kennedy Center, Chicago Symphony Hall and San Diego's Copley Symphony Hall. "For Whom the Bell Tolls" is about 16 minutes in length. It starts out with "Anthem for Doomed Youth" which depicts the horrors of war; transitions into the famous "In Flander's Fields" poem; and finishes with "Agnus Dei", a setting of the Latin Mass text that Gemmell described as "soothing, calming and comforting." On the first anniversary of Sept. 11, in 2002, Gemmell played for his choir a CD that had a bare-bones, music-only version of "For Whom the Bell Tolls" sent to him by Nelson. As the students listened to the music and read the text and words that they would sing, they were mesmerized and moved, said Gemmell. "As we listened and imagined what it would sound like with human voices, we were visibly touched. Some of us were even moved to the point of tears. The combination of the poetry and the music that Nelson came up with is extremely powerful." The Fresno and Chico choir groups each chose a movement of the piece that they would perform at their separate Fall concerts. Chico performed the second movement, "In Flander's Fields", and Fresno premiered the third movement, "Agnus Dei". Having the two choral groups perform "For Whom the Bell Tolls" in its entirety at the convention resulted in a powerful and moving experience for the audience, said Gemmell. "Some of the audience members were moved to tears. It is a piece that can't help but transport you to another time and place. It is also a very difficult composition and it really challenges the students to reach beyond anything they have done before." The first movement, "Anthem for Doomed Youth", is based on a poem by World War I 2nd Lt. Wilfred Owen and expresses the horrors of war in graphic detail. "This first movement is atonal and dissonant. It has an avant-garde feel and reminds me dramatically of the opening scene from the movie, 'Saving Private Ryan.'" The second movement, "In Flanders Fields", is based on the famous poem of the same title written by World War Lt. Col. John McCrae. Gemmell described the movement musically as being "like a motion picture soundtrack with lots of color, tension and release, and a restless searching for inner peace. It is as if the dead are walking among the rubbles of war," said Gemmell. "The poem was written during World War I, but for us, as we listened to it for the first time, the battlefield was Ground Zero." The third movement, "Agnus Dei", is very consonant, prayerful and calming. It may remind some people of Gregorian chant music or a Renaissance a cappella choral motet. It is the only movement with no instrumental accompaniment, which adds a spiritual feel to the conclusion of the piece. "It is a plea for mercy and peace." Performing "For Whom the Bell Tolls" at the California Music Educators Convention was an honor, said Gemmell. "Only three college choirs from the entire state were invited to perform at the convention. It was very prestigious for our choral program, and for the university, to sing the world premiere of this monumental work." On their way down to the convention, Gemmell and the Chamber Singers - Chico State's most select choral ensemble - performed selections from "For Whom the Bell Tolls" at several high schools in the Bakersfield area. In addition to the performance of "For Whom the Bell Tolls" on Saturday and Sunday, Gemmell said Chico choral enthusiasts will get a chance in mid-April to hear "For Whom the Bell Tolls" as it was performed at the convention. 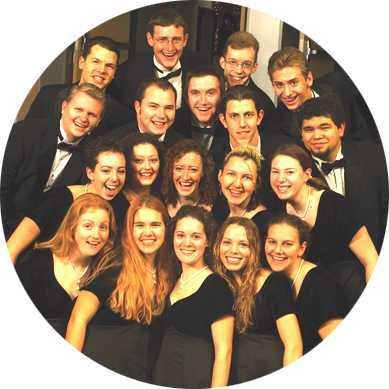 The Fresno choral group is doing a Northern California tour and is planning on making a stop in Chico. "We are still working on a date - probably April 21 or 22. More than likely the two groups will perform together off campus somewhere." For information, call Gemmell at (530) 898-6127.